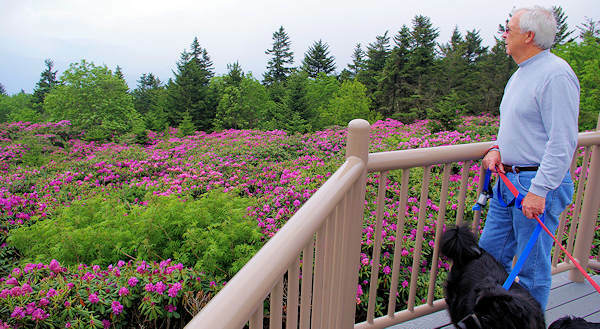 Roan Mountain is famous for its spectacular natural gardens of Catawba rhododendron (Rhododendron catawbiense). The peak bloom time for the sea of purple-magenta is usually mid June, plus or minus a week depending on weather. 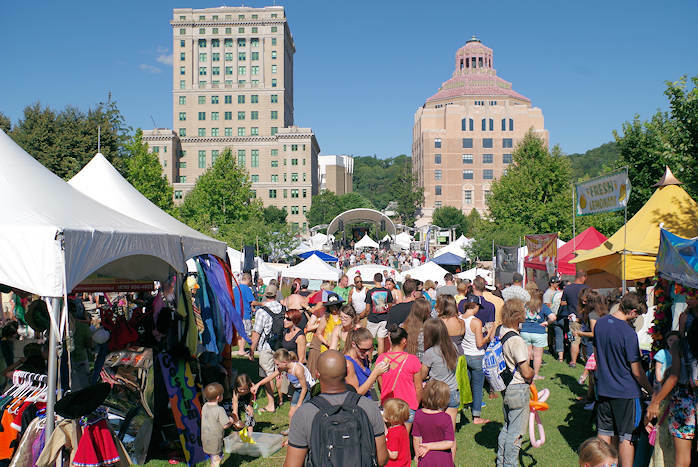 The area is located on the North Carolina / Tennessee state line - the Pisgah National Forest in NC and Cherokee National Forest in TN. The nearest town is Bakersville. 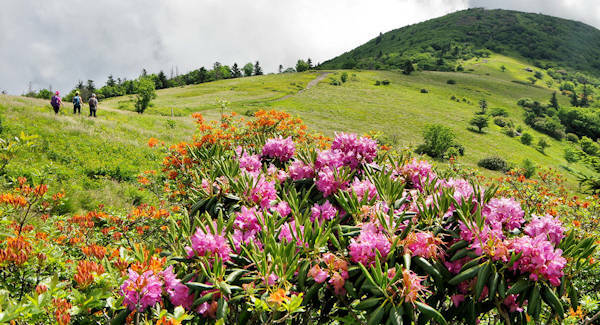 Enjoy the blooms in two areas: a scenic hike along the Appalachian Trail from Carver's Gap or nearby the Recreation Area with an easy paved trail and picnic area. 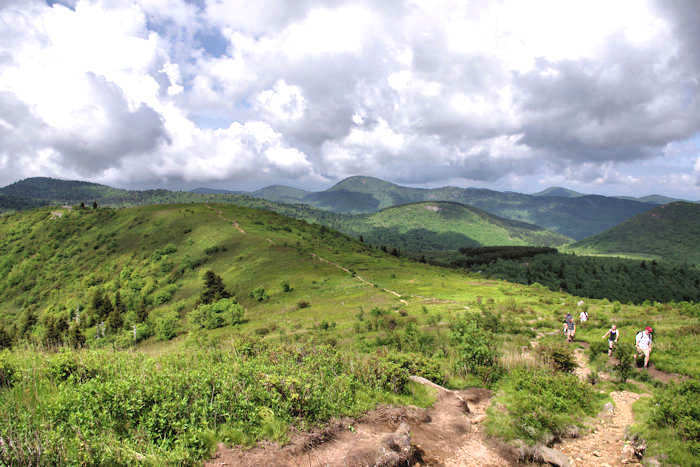 Option 1: For one of the most spectacular hikes in the mountains, walk the Appalachian Trail from Carvers Gap up (parking area adjacent to NC Highway 261) and over several bald peaks with panoramic views all the way! See photos and details of this unforgetable hike across the balds of Roan. It's also our favorite spot for a winter wonderland hike in the snow (read more). There is no fee for this parking area. 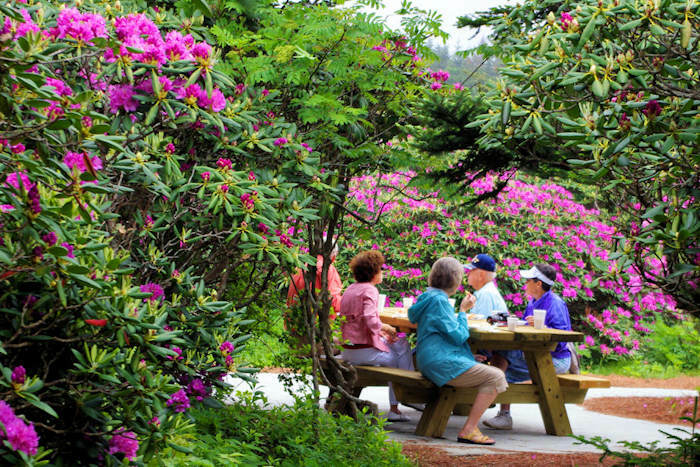 Option 2: Drive into the Recreation Area for to find the picnic area, observation deck, restrooms and half-mile sidewalk trail through the rhododendron gardens in the Recreation Area. Enter this area from Carver's Gap - if you are driving from North Carolina, turn left at Carver's Gap sign before you cross into Tennessee. The fee for this area is $3/car. This area is open Memorial Day through the end of September. Flame azaleas on the balds along the Appalachian Trail, peaking right after the rhododendron. There are many options for amazing hikes in this area. 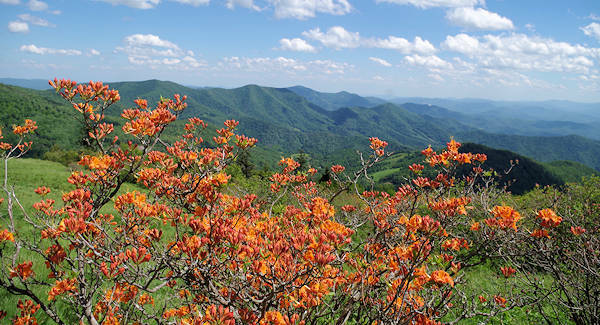 See our Roan Mountain Hiking Guide that includes a five-mile spectacular hike on the Appalachian Trail where you will find many flame azaleas blooming at the same time. The Cloudland Trail is within the Recreation Area. The summits are always cooler (often 15-20 degrees colder than Asheville), especially if covered in clouds. Bring a jacket even on summer days. Beware! The weather can change quickly. So be prepared. Go west on I-26 about 18 miles to Mars Hill. Take exit 9 toward Burnsville/Spruce Pine. Go another 18 miles through Burnsville (or stop for lunch or exploring downtown). 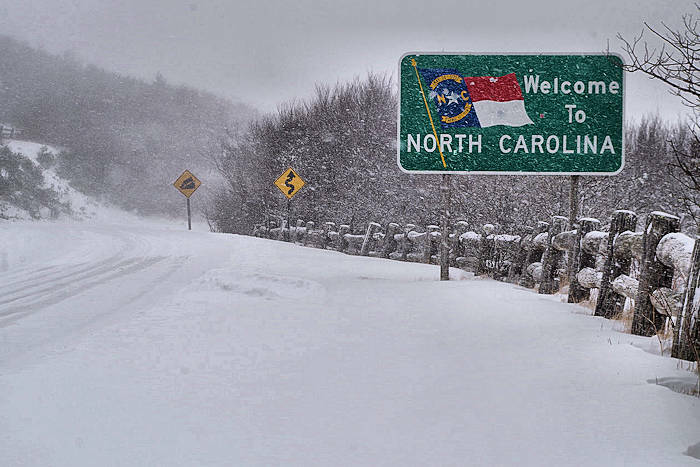 Turn left on NC 197 North and go about 11 miles. Turn right onto NC 226 South toward Bakersville (5.5 miles). In Bakersville, turn left onto NC 261 North and go 12.8 miles to Carver's Gap at TN state line. Read about this scenic drive. Turn left at Carvers Gap. There's parking area and restrooms immediately on your right. Or keep driving to enter the Recreation Area for picnic areas, paved trail and gardens. See Google Map below for directions from your location. 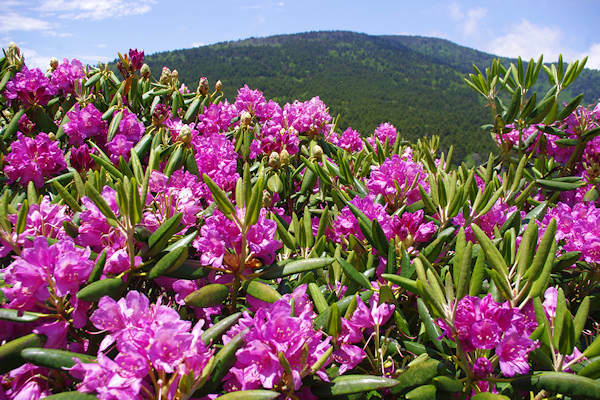 Two Rhododendron Festivals (North Carolina and Tennessee versions) are held in the Roan Mountain area! The one in Bakersville NC is Friday & Saturday.